It is definitely one of the best alternative ways of converting a Type 4 engine to a upright fan, since many of the existing parts can be reused. As a result of the STD design a good cooling air distribution is guaranteed. Original 32kW / 44HP or 37kW / 50HP fan housings can be used. 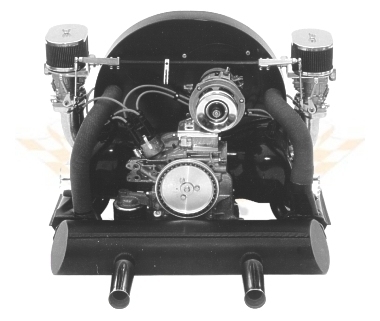 However, we recommend our 22KW / 30 HP style fan housing, which can also accept the large fan rotor, in order to create more space for the carburettor. The use of the original fan rotor also provides the advantage that it is very quiet in operation. Minor drilling tasks are necessary on the engine case (CU engine cases require milling tasks). The alternator stand, which is suitable for mounting either DC or AC generators, is screwed onto the engine casing with the accompanying retaining block. 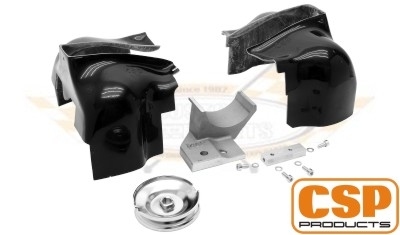 The black gelcoated cylinder covers are made from glass fibre reinforced plastic and the locations of the sparking plug holes are only indicated, so that they can be drilled according to the cylinder heads that are being used. The production standard oil cooler is removed and need to be replaced by a front oil cooler.